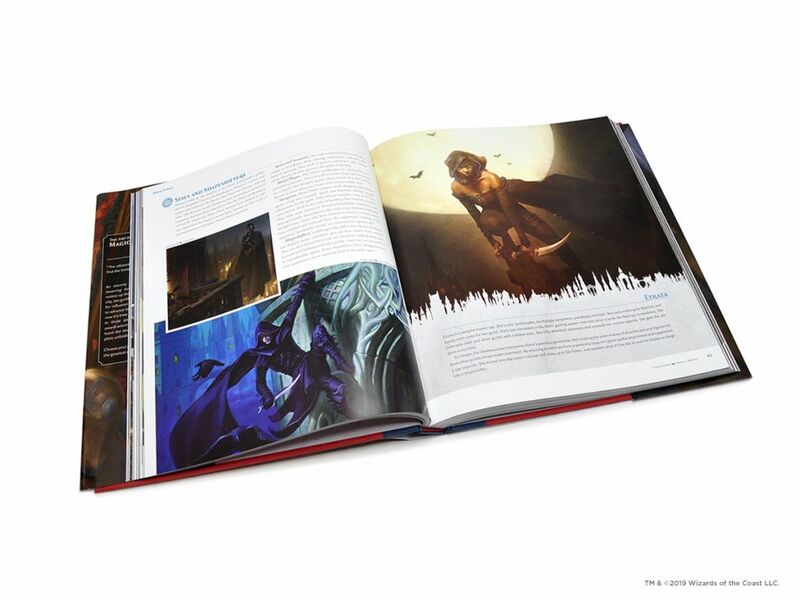 Viz recently released their latest art book from the Magic: the Gathering universe with The Art of Magic: The Gathering – Ravnica. I’ve previously reviewed Concepts & Legends and Ixalan. 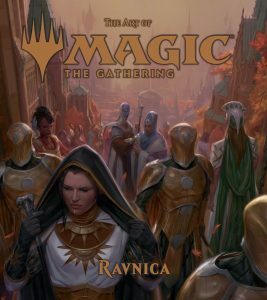 I was expecting Ravnica to be similar in structure to Ixalan, and I suppose it was, but… I wasn’t expecting flashbacks to Mean Girls. We open up with Pause for Reflection (Alanya Danner) and the table of contents on pages 2-3. Cute. We have our foreword, this time by Vice President Elaine Chase, and our overview of all the planes. They continue their wry sense of humor on pages 8-9, with Plains (Richard Wright). 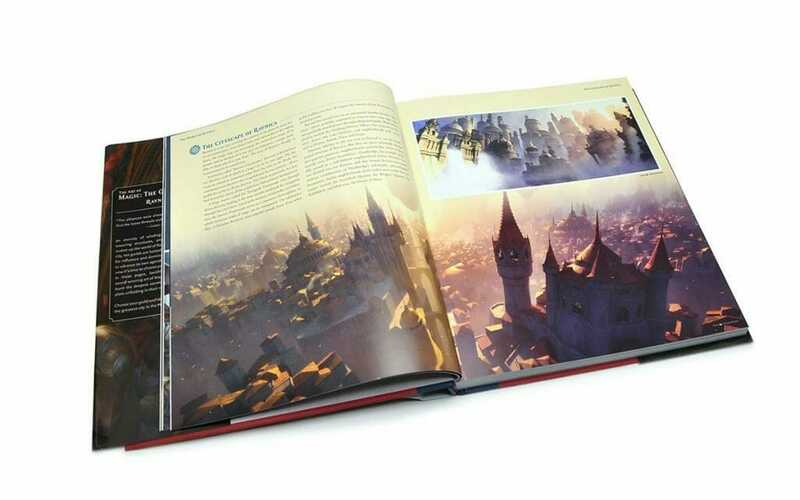 Pages 8-17 are an overview of Ravnica. Page 13 has a rundown of the ten guilds and their roles in Ravnican society. Rakdos is a mining guild. It was Gruul, not Rakdos, who was led by Cisarzim, The Lord of Chaos. We don’t know who first led the Simic. Hmm…. 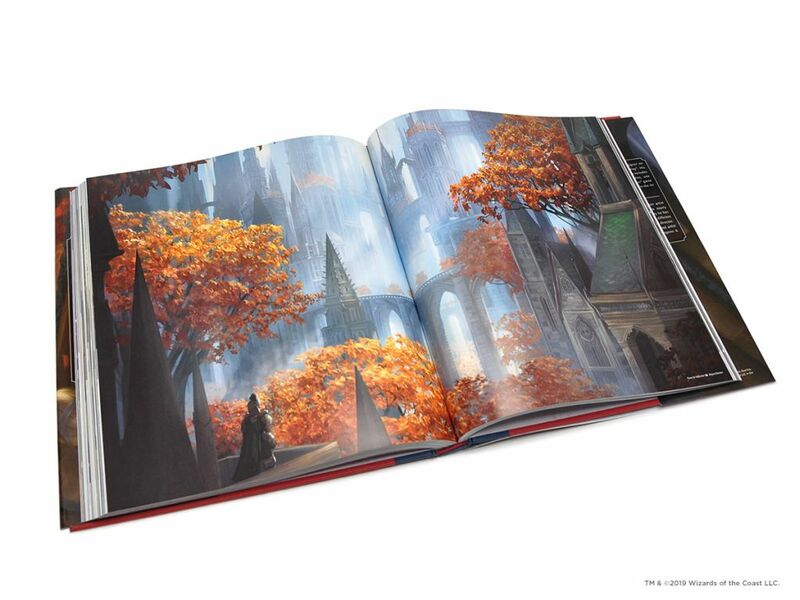 The most notable piece of art from this section is Island (Richard Wright) on page 17, simply because there are no Islands on Ravnica, meaning that he had to innovate. Their bureaucracy is so byzantine that you’d need to be Hermes Conrad to navigate it. They had to beg Supreme Judge Isperia to lead them. With Jace gone, they consider emergency conditions to be “the new normal”, and have responded accordingly. “To prevent action is to prevent transgression.” -Azorius arrester motto. Lavinia refuses to step into the power vacuum in Jace’s absence. Agmand Sarv was a controversial pick to lead the Lyev column. The art for Archon of the Triumvirate (David Rapoza) on page 29 gives me flashbacks to Falkor. It’s my favorite from the section, although Lavinia (Willian Murai) in all her stern glory on page 30, comes close. On page 33, we see how Azorious feels towards the other guilds in a section appropriately titled “Attitudes and Relationships.” The main surprise here is that they view the Orzov, not the Rakdos or Dimir, as the greatest threat to Ravnican society. The Orzov Syndicate are next up, covering pages 34-53. The two-page spread of Ministrant of Obligation tells us exactly who the Orzhov are. Even ghosts have to pay tribute. For them, wealth is power, even beyond the grave. They’re clearly styled off of the mafia, with internal conflicts to match. When the undead rule from beyond the grave, the living can get a bit restless. Grand Envoy Teysa Karlov’s rebellion may have failed, but that doesn’t mean the Obzedat can rest easy. Sin Collector (Izzy) page 40- This might be may favorite artwork in the book. We learn that they consider the Dimir “an odd ally,” but have no close connections to the other guilds. I suppose the Orzhov try to keep their relationships strictly professional. House Dimir are up next, covering pages 54-71. The highlight here is the full and accurate transcript of an interview with the agent known as “Strava” on page 59. I won’t spoil it for you. Lazav, the Multifarious (Yongjae Choi) on pages 60-61 is stunning. The key piece of information we learn here is that Lazav knows that another mastermind is gunning for control of Ravnica, and is doing all he can to prevent that. We also learn that Etrata, the guilds top assassin and spy, is not a fan of Lazav’s work. Rather, he expects that he’ll eventually show up on her list of targets. No real surprises in their relationships with the other guilds. We learn that their method of dealing with the Azorius surveillance state is to flood it with misinformation. The Izzet League covers pages 72-89. Firemind’s Research (Grzegorz Rutkowski), on pages 76-77, is memorizing. Niv-Mizzet has a very expressive face. 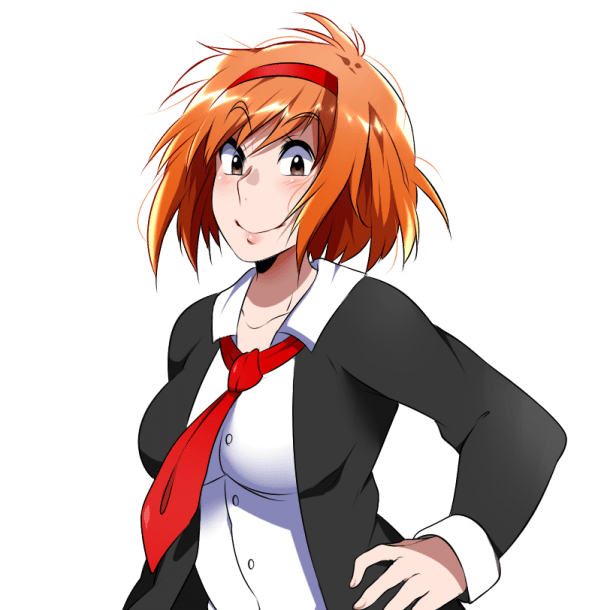 Fluxcharger (Willian Murai) on page 82 gives me “Dr. Manhattan” vibes, although with more of a lightning twist. The Izzet consider the other guilds boring, with various degrees of annoyance. The Cult of Rakdos covers pages 90-107. It’s a pyrotechnic circus with a love for sharp objects. The striking Spikewheel Acrobat (Deruchenko Alexander) greets us on pages 90-91. Of note for the Rakdos is that, like the Izzet, they have retained their original parun. Rakdos, the Defiler remains in charge of the guild, though Judith, the Scourge Diva has grown displeased with his leadership. We’ve seen demons toppled before, but I’m not sure Judith has what it takes. 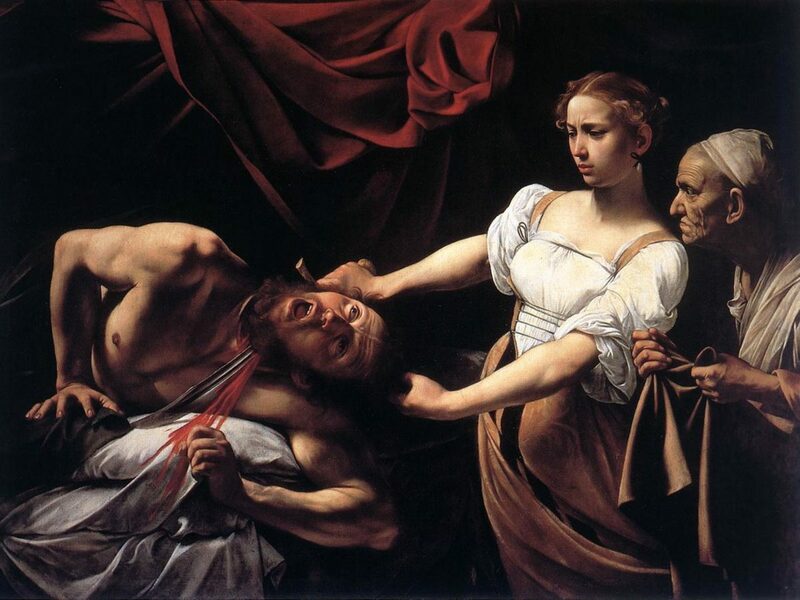 Then again, if art history tells us anything, it’s that we should not underestimate Judith. The entire section is filled with stunning pieces, but if I had to choose one, it would be Macabre Mockery (Derchenko Alexander) on pages 102-103. Their views on the other guilds made me laugh. The Rakdos may be wild, but they still have a sharp sense of humor. They view the Gruul as kindred spirits, the Boros as their straight-men. The Golgari Swarm get their due on pages 108-125. A common theme is that the Golgari are the least respected of the guilds. Part of that is due to their role in Ravnican society. After all, how much does on respect, or even think about, one’s garbage remover? 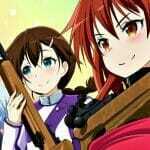 That said, part of it is their own fault for being a guild at constant war with itself. The history of the Golgari is that of a guild unafraid of death. Jarad Vod Savo may rule for the moment, but any number of suitors would love to depose him. My guess is that one will eventually succeed. Pitiless Gorgon (Alex Konstad) on page 114 is my favorite piece in the section, with honorable mentions for Kruul Swamp (Jehan Choo) on page 116, and Corpsejack Menace (Chris Rahn) on page 121. The Golgari have no close ties with the other guilds, having fallen out of favor with the Dimir. They could be friends with the Gruul, if the Gruul were into having friends. Speaking of the Gruul Clans, they cover pages 126-143. They are a wild people in an urban world. They are quite literally at war with the world, itself. In a different context, they might be friends and allies with the Boros. Here, they are enemies, striking at each others’ territory. The Gruul are too wild to have a coherent organization. 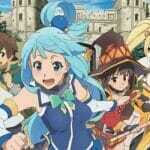 Instead, they are split into various clans. Borborygmos leads the Burning Tree Clan, which is the largest among the Gruul. The Ghor Clan is their only true rival, led by Ruric Thar. Perhaps, in time, Ruric Thar will unseat Borborygmos. The more interesting question is “will Illhag, the Raze-Boar trample over Ravnica?” The Gruul rage at what they, and the world, has lost. For more on this, check out “The Old Ways” on page 135. Savageborn Hydra (Raymond Swanland) on page 130, Burning-Tree Bloodscale (Kev Walker) on page 131, and the Gojira-esque Ravager Wurm (Svetlin Velinov) on pages 136-137 are my favorite works from this section. The Boros are led by the angel Aurelia. Tajic, Blade of the Legion is the highest ranking human, and it is his story that may shape the Boros going forward. He attempted to work with Niv-Mizzet to create an ultimate soldier, but that project failed and he left thinking of Niv-Mizzet’s would-be tyrant. He also worked with Teysa Karlov in an attempt to overthrow the Obzedat. That plan also failed and left him in jail (soon rescued by Aurelia). At this point, Tajic’s reservoir of trust has run dry, and he no longer believes the Boros should work with the other guilds. Aurelia feels differently, so Tajic holds his tongue. More on this story on page 158. Chance for Glory (Bram Sels) on pages 152-153 is my favorite piece from this section. Honorable mentions to Skyknight Legionnaire (Chase Stone) on page 154, Goblin Banneret (Victor Titov) on page 155, and Blade Instructor (Zoltan Boros) on page 156. Yes, an artist named Boros worked on the Boros Legion. The Selesnya Conclave are covered on pages 162-179. Their leader, Trostani, is crippled with indecision (it really is high school all over again). They value harmony and growth, and seek the power to survive and thrive, even as Ravnica tilts towards war. Oddly, for a guild so focused on unity, they are rather divided at the moment. 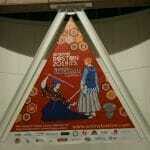 Additionally, they don’t have close ties with any of the other guilds. Peace in our time will be a challenge. We get a textless look at Pause for Reflection (Alanya Danner) on pages 170-171. That’s my favorite piece from the section, though Shielded Passage (Raymond Swanland) on pages 178-179 is quite nice, as well. The Simic Combine are the last of the guilds, covering pages 180-201. Aeromunclus (Simon Dominic) on page 182, Benthic Biomancer (Daarken) on page 184, and Growth-Chamber Guardian (Bram Sels) on page 186 give us a good sense of what we’re dealing with here. Like the other guilds, the Simic are dealing with internal conflict. Prime Speaker Vannifar has unseated Speaker Zegana. Vannifar is less interested in working with the other guilds. She came to power when asked for assistance in dealing with a Golgari threat. Special mention to Galloping Lizrog (Luis Lasahido) and its hilarious shoulder-gear on page 196. Ravnica doesn’t need an outside agitator to have a nice full story, but it has one anyway. Claws of the Mastermind covers pages 202-227. There are massive spoilers here, so I’ll let you discover them on your own. That said, I will say that Yongjae Choi’s painting of Kaya on page 221 is fantastic, as is Chris Rallis’s piece on Dovin Baan. We close with the Appendix, which, I kid you not, covers changing guild fashion over the years. Kudos to whomever wrote the Selesnya text in this section. As has been the case with all of Viz Media’s previous art books in the Magic: the Gathering universe, the quality is high, here. There’s a bit more text than I’d become accustomed to, as this is quite the lore and story book. Still, with Ravnica Allegiance scheduled to be released later this month, the timing is perfect. The city of guilds will shine once again.